Want to expand your content promotion beyond Outbrain or Taboola? Looking for alternatives to Facebook and Google? While many ad networks exist; only a few are worth your time and money. Save yourself some frustration with this short list of native ad networks to use your test budget. Outbrain is a content discovery platform that partners with websites, known as publishers, and mobile apps to show ads. 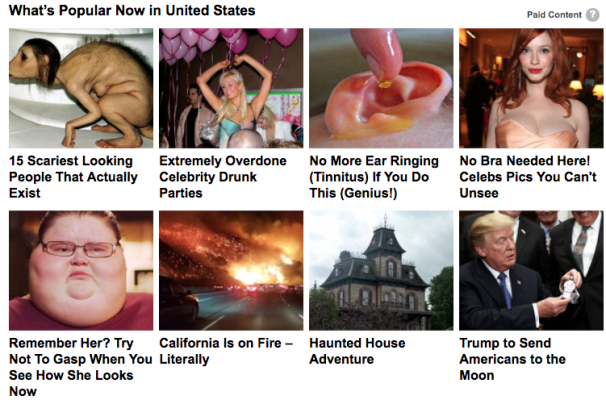 You see content recommendations, aka ads, at the bottom of news stories and blog posts. This is a popular form of native advertising. Pro's: Great for brand awareness and performance marketing, cost-effective, API available. Con's: Trial and error to find ad creative winner. 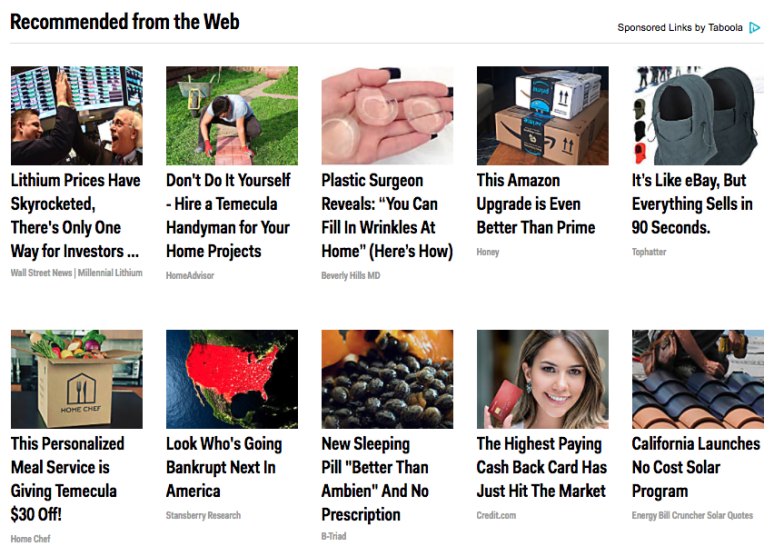 Outbrain's largest global competitor in terms of customers, revenue and funding is Taboola. Headquartered in New York City with research & development in Israel, Taboola employs over 650 people with offices in 9 cities worldwide. Top publishers include MSN, USA TODAY, Business Insider, Chicago Tribune, and The Weather Channel. Pro's: High-quality publishers, granular site targeting, cost-effective. Public API documentation. Con's: Requires trial and error, UI is difficult and time-consuming. Data delays are common. Revcontent is a great alternative that results in a lower cost per click (CPC) and CPA than Outbrain for some advertisers. Revcontent requires a daily budget of $100 per campaign with a minimum bid of $0.01. Pro's: Whitelist and Blacklist to protect against brand safety & fraud, 3x targeting options as Facebook, real-time data for optimization. Public API. Con's: Must monitor for fraud, limited scale compared to Outbrain & Taboola. Sharethrough for Advertisers (SFX) is a programmatic native advertising exchange that claims the largest direct supply of native ads. What this means is you must use SFX to show native ads on websites such as VICE, Sky Media, and Rolling Stone. Sharethrough uses an in-feed ad unit similar to Facebook, Twitter, and Linkedin. They have 170+ employees across 8 offices and have raised $34 million in funding since 2007. Pro's: Exclusive access to premium publishers, API available. Con's: Harder to get ads approved due to high-quality standards. Verizon acquired Yahoo in 2017 and renamed the division "Oath"; Yahoo Gemini is the native ad product to reach Oath's Yahoo/AOL properties including Yahoo News, Fantasy Sports and Tumblr. Yahoo Gemini is probably the easiest to use for newcomers with a very intuitive wizard for launching ad campaigns. They offer unique targeting with Age & Gender demographic options that are lacking from Outbrain & Taboola. Pro's: Huge reach across premium websites and mobile apps. Easy to use. 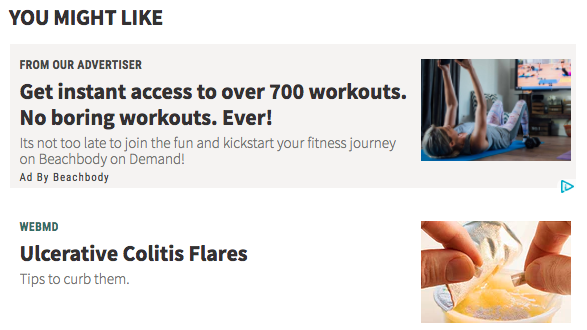 Excellent targeting options. Well supported API. Con's: Vague reasons for disapproved ads, must monitor for fraud/bot traffic. Cannot separate desktop & mobile. Nativo is a demand-side platform (DSP) located in El Segundo, California that has raised nearly $32 million venture capital funding. 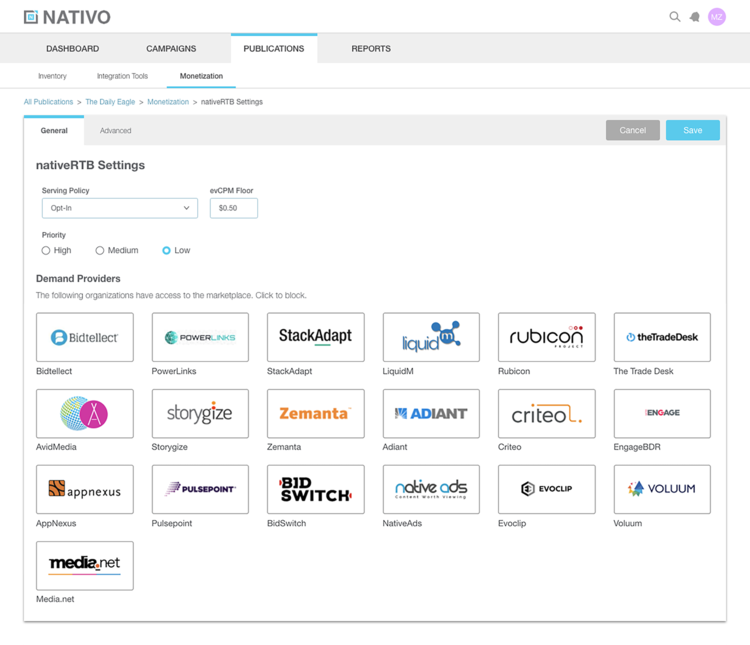 Nativo taps into existing supply-side platforms (SSP) to provide a single place to buy using real-time bidding (RTB) rather than signing up for two dozen ad networks. Many of the sources are traditional banner ad networks. Pro's: Access to large inventory across multiple networks. Easy to use. Con's: Price is marked up by an unknown amount, some inventory is display sold as native. 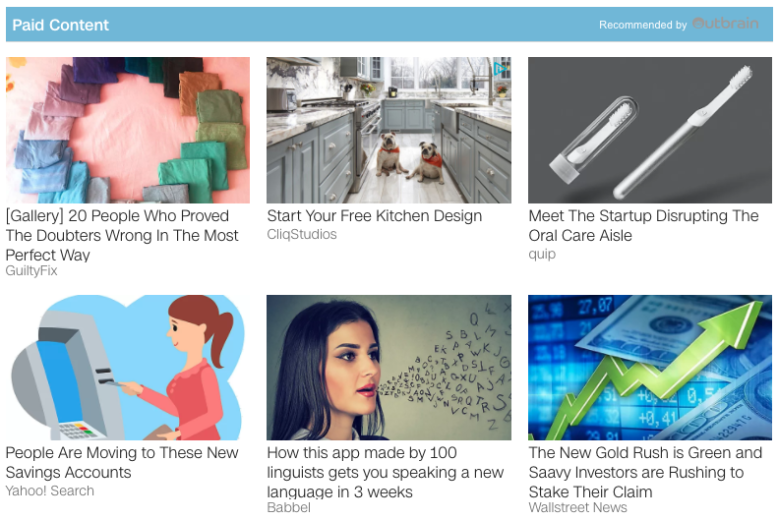 Ligatus is a strong Outbrain & Taboola competitor in the European markets. Over 1,400 partners in 10 European countries use Ligatus for native ads. Ligatus offers programmatic native advertising campaigns on a cost per click (CPC), cost per lead (CPL) and cost per thousand (CPM) basis; neither Outbrain nor Taboola offers CPL campaigns. Pro's: Access to a selective and transparent network of premium publishers. Strict advertising guidelines for brand safety. Con's: Self-serve tools a bit lacking, not intuitive. No API for integrations. Dianomi is a financial service native ad network focused on Business & Finance verticals. Advertisers reach an affluent audience running campaigns on a CPC or CPL. Dianomi headquartered in London, England since inception in 2003 boasts an impressive roster of advertisers & publishers. Pro's: High-quality publishers, great for reaching financial and business publication audiences, backs out to competitive cpa. Con's: Limited to financial publications, no API. MGID is a smaller ad network with cheaper traffic that's a great entry point into native for direct response offers. MGID originates from Ukraine with its headquarters now in Los Angeles, California. Are you a B2C performance marketer driven with an advertorial or listicle to promote? Try MGID. Pro's: Lower cost for similar audiences, direct response/affiliates welcomed, Public API. Spoutable is a newer native ad network that offers custom units with premium brand and media partnerships. Spoutable focuses on viewability, engagement and ROI optimization based on proprietary "Passion Profiles". Brand campaigns are custom tailored so advertiser setup is managed by Spoutable. Pro's: Highly engaging ad formats, customize for the advertiser. Con's: No self-serve, set up by email. Content.ad appeals to direct response marketers because it allows aggressive ad creatives. It is a smaller network so there is limited volume. The team is hands-on tuning campaigns to meet your CPA. Content.ad is used by affiliate marketers in the health supplements, financial services, and dating niches. Pro's: Easy to start, CPC based on content type: slideshows vs advertorial. Con's: Must monitor for fraud, limited volume, Brand safety is a concern. Limited API support.